Received January 3, 2018; Revised March 12, 2018; Accepted March 13, 2018. Silver (Ag) has been widely used in commercial products and medical fields since ancient times because of its antibacterial effect. It is harmless and non-toxic to the human body. For this reason, recent research has actively evaluated antimicrobial activity using silver (Ag). 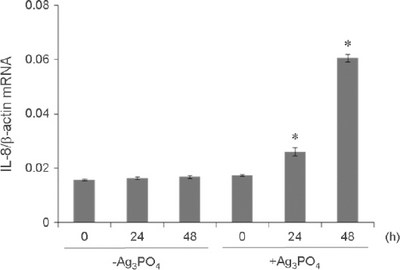 In this study, we investigated the inhibitory effect of a silver-based compound, silver phosphate (Ag3PO4) on the growth of Staphylococcus aureus and the activation of human immunity. First, the inhibitory effect of Ag3PO4 on the growth of Staphylococcus aureus was confirmed by a growth curve and a colony-ounting method. As a result, the growth inhibitory effect increased as the concentration of Ag3PO4 increased. Specifically, treatment with 5 μg/mL of Ag3PO4 resulted in no bacteria growth, and the colony-counting method showed a remarkable inhibition. In addition, the expression of cytokine IL-8 by Ag3PO4 was examined to investigate the cellular immune system activation by Ag3PO4. After pretreatment of Staphylococcus aureus for 1 hour with 50 μg/mL Ag3PO4, an increased IL-8 mRNA expression resulted. In cells treated with Ag3PO4, we found that the expression of IL-8 was enhanced in a time-dependent fashion compared to non-treated cells. These results indicate that Ag3PO4 induces antimicrobial activity against Staphylococcus aureus and activates human immunity. These results are expected to contribute to the future study of the mechanism of silver (Ag) and silver-based compounds in relation to antibacterial activity. 은(Ag, silver)은 항균 효과 때문에 고대부터 상업 제품 및 의료 분야에서 다양하게 사용되고 있다(Klaine et al., 2008). 최근에는 은 이온(Ag+)이 박테리아의 대사경로를 억제하여 ROS 생산을 유도하고 이 변화가 디설파이드 결합 형성을 억제함으로써 막 투과성을 증가시켜 박테리아 세포사멸을 유도한다는 것이 밝혀졌다(Morones-Ramirez et al., 2013). 또한 Ag3PO4가 식물 줄기 마름병의 원인균인 Pseudomonas syrigae의 성장을 억제하고 식물면역체계를 유도함이 밝혀져 효과적인 식물 질병 조절제로서의 사용가능성이 제시되었다(Kim et al., 2016). Staphylococcus aureus는 그람양성균인 포도상구균의 한 종으로 식중독뿐만 아니라 피부의 화농 · 중이염 · 방광염 등 화농성 질환을 일으키는 원인균이다(Masalha et al., 2001). 페니실린(메티실린, 디콜록사실린, 납실린, 옥사실린 외)과 세팔로스포린을 포함한 β-락탐계 항생물질에 내성을 획득한 황색 포도상구균은 메티실린 내성 황색 포도상구균(Methicillin-resistant Staphylococcus aureus, MRSA)이라 하는데, 사람에게 감염되어 여러 가지 병을 일으켜 문제가 되고 있다(Gurusamy et al., 2013). 본 논문에서는 Staphylococcus aureus에 대한 은의 항균 효과 및 면역반응을 조사하여 그 결과를 보고하고자 한다. 본 연구에 사용된 시약은 Ag3PO4 (Sigma-Aldrich, USA)이다. 실험에서 사용된 미생물은 Staphylococcus aureus ATCC 6538로서 생물자원센터에서 분양받아 사용하였다. 배양배지는 Tryptic soy broth (TSB)를 사용하였다. 사용한 세포는 비소세포폐암 세포주인 H1299 (Korean Cell Line Bank, Korea)이다. 배양배지는 DMEM (Hyclone, UK)에 10% Fetal Bovine Serum (FBS) (Hyclone)를 첨가하여 사용하였다. 배양은 37°C, 5% CO2 인큐베이터에서 진행하였다. 24시간 동안 계대배양한 Staphylococcus aureus를 새로운 배양배지에 A600nm=0.06 되도록 희석한 균주에 Ag3PO4를 첨가하지 않거나 첨가하여 37°C에서 배양하였다. 0일째부터 7일째까지 균주를 키우면서 정해진 시간에 A600nm에서 흡광도를 측정하여 성장곡선을 그렸다. 또한 콜로니 카운팅 방법은 위와 같은 방법으로 키운 Staphylococcus aureus를 10배수 계열희석 10-1에서 10-8까지 희석하여 각각의 colony 수를 계산하였다. H1299 세포를 six-well plates containing ~106 cells/well 되도록 심었다. 16시간 후 Staphylococcus aureus를 1시간 선처리 후 50 μg/mL의 Ag3PO4를 24, 48시간 동안 처리하였다. 이때 extracellular bacteria를 제거한 후 gentamicin (50 μg/mL)이 첨가된 배양액에서 배양하여 남아있는 extracellular bacteria를 완전히 제거하였다(Kim et al., 1998; Eckmann et al., 1993). 이후의 과정은 다음과 같다. RNA 분리 및 정량: 배양한 H1299 세포로부터 RNA를 분리하기 위하여 TRIzol reagent (Gibco, USA)을 사용하여 제작사의 설명서에 따라 분리하였다. 각 대조군과 실험군으로부터 분리한 RNA를 60°C water bath에서 10분간 가열시켜 single strand로 분리한 후 spectrophotometer (Biophotometer, Germany)를 이용하여 RNA 농도 및 순수도를 측정하였다. 역전사 반응(Reverse transcription): 각각의 대조군과 실험군으로부터 분리하여 정량, 보정한 RNA 1 μg에 RNA PCR Kit Ver2.1 (TaKaRa, Japan)를 이용하여 제작사의 설명서에 따라 역전사 반응을 실행하였다. 실시간 정량 PCR (Real time quantitative polymerase chain reaction): cDNA와 IL-8 유전자의 primers (Forward 5’-TGCCAAGGAGTGCTAAAG-3’, Reverse 5’-CTTCTCCA-CAACCCTCTG-3’)로 디자인한 Light Cycler probes (Sigma-Aldrich) 그리고 Light Cycler reaction protocol에 따라 만든 mixture를 섞어 만든 각각의 반응 혼합액을 tube에, 한 실험 개체당 20 μL씩 채운 다음, 95°C 1분(1회), 95°C 10초(1회), [60°C 15초, 72°C 15초](40회)의 thermal cycling condition에서 Light Cycler (Roche, Germany)를 이용하여 실시간 정량 PCR (RT-PCR)을 진행시켰다. Beta-actin 유전자를 기준 표지자로 이용하였다. Ag3PO4에 의한 Staphylococcus aureus의 성장 억제 효과를 조사하기 위해 배양액에서의 농도가 각각 0.5, 5 μg/mL 되도록 첨가하여 Staphylococcus aureus의 성장곡선을 관찰하였다(Fig. 1A). Ag3PO4가 0.5 μg/mL 첨가된 경우에는 Ag3PO4를 첨가하지 않은 대조군과 비교하여 성장 억제 효과를 나타내었다. 한편 5 μg/mL에서는 균이 성장하지 못하였다. Ag3PO4에 의한 Staphylococcus aureus의 성장 억제 효과를 더 확인하기 위해 콜로니 카운팅 방법을 이용하여 실험하였다. Ag3PO4가 0.5 μg/mL가 첨가된 경우에는 성장 억제 효과를 보이다가 4일 후에는 대조군과 비슷한 수준으로 되돌아 갔다. 그러나 5 μg/mL에서는 시간이 지나도 뚜렷한 성장 억제 효과를 보였다(Fig. 1B). 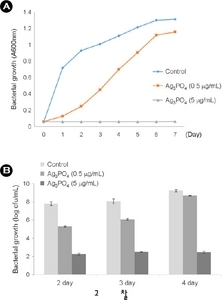 Inhibition of Staphylococcus aureus growth by Ag3PO4. Overnight-grown bacteria were diluted and aliquoted into new tubes with A600nm=0.06. They were further grown with or without the indicated amounts of Ag3PO4. Bacterial growth was then analyzed at the indicated time points by measuring values of A600nm (A) or by counting bacterial colonies (B). Data represent mean ± SD from three biological replications. 우리 몸은 병원성균 침입시 이에 대항하기 위한 선천성 면역반응을 통해 NF-κB가 활성화되고 활성화된 NF-κB는 후천성 면역반응을 유도하여 여러 질병으로부터 우리 몸을 보호한다(Kim et al., 1998; Elewaut et al., 1999; O’Neill et al., 2013; Yusa et al., 2017). 이러한 NF-κB 활성화는 사이토카인(cytokine)과 같은 면역반응 물질을 유도하여 세포의 증식/사멸을 증가시키는 것으로 알려져 있다(Kim et al., 1998; Elewaut et al., 1999; O’Neill et al., 2013). Ag3PO4에 의한 Staphylococcus aureus의 성장 억제 효과를 확인하였는데(Fig. 1), 이러한 결과는 면역작용 활성화와 관련 있을 가능성이 크다. 이를 알아보고자 NF-κB에 의해 발현이 조절되는 유전자 중 대표적인 사이토카인 인 interleukin-8 (IL-8)의 전사가 Ag3PO4에 의해 영향을 받는지 조사하였다. Staphylococcus aureus를 1시간 선처리 후 50 μg/mL의 Ag3PO4를 처리한 후 IL-8의 발현양을 정량한 위한 RT-PCR 결과는 다음과 같다(Table 1). Staphylococcus aureus 처리 후 50 μg/mL의 Ag3PO4를 처리해 주었을 때 IL-8의 mRNA 발현이 증가되는 것을 확인하였다(Fig. 2). IL-8의 mRNA 발현은 Ag3PO4를 처리한 시간이 늘어날수록 증가하였다. 한편, Ag3PO4를 처리하지 않은 대조군은 IL-8의 mRNA 발현이 증가하지 않았다. Induction of human immune responses by Ag3PO4. Ag3PO4 induces the expression of IL-8. H1299 cells were treated with or without 50 μg/mL Ag3PO4 for the indicated time. RNA extracts were then subject to real time RT-PCR analysis with a LightCycler® Nano System (Roche). Primers used were; 5’-TGCCAAGGAGTGCTAAAG-3’ and 5’-CTTCTCCACAACCCTCTG for IL-8, and 5’-GTTGCTATCCAGGCTGTG and 5’-TGATCTTGATCTTCATTGTG for β-actin. Relative transcript amounts of IL-8 were normalized against β-actin. Bar, mean ± SD from three biological replications. *, P<0.05 in comparison to non-treated cells. 본 연구는 Staphylococcus aureus에 대한 은의 항균 효과 및 면역반응을 조사하여 그 결과를 알아보고자 진행되었다. 은(Ag, silver)이 Escherichia coli, Pseudomonas syrigae 등의 박테리아의 성장을 억제한다고 보고되었다(Morones-Ramirez et al., 2013; Kim et al., 2016). 본 연구진은 Ag3PO4를 이용하여 다른 박테리아의 한 종류인 Staphylococcus aureus를 이용하여 Ag3PO4의 성장 억제 효과를 관찰하였다. Ag3PO4에 의한 Staphylococcus aureus의 성장 억제 효과를 성장곡선과 콜로니 카운팅 방법을 이용하여 확인한 결과 Ag3PO4의 농도가 증가할수록 성장 억제 효과가 증가하는 것을 확인하였다. 특히, 5 μg/mL의 Ag3PO4를 처리한 경우는 균이 성장하지 못하였고 콜로니 카운팅 방법에서는 뚜렷한 성장 억제 양상을 보였다. 이는 종전에 발표된 은이온 및 은나노 입자에 의한 항균작용과 비슷한 결과를 보였다(Chen et al., 2011; Li et al., 2010). Ag3PO4가 식물 줄기 마름병의 원인균인 Pseudomonas syrigae의 성장을 억제하고 식물면역체계를 유도함이 밝혀졌다(Kim et al., 2016). 또한 우리 몸은 병원성균 침입시 이에 대항하기 위한 선천성 면역반응을 통해 NF-κB가 활성화되고 활성화된 NF-κB는 후천성 면역반응을 유도하는데, 사이토카인과 같은 면역반응 물질을 분비하여 여러 질병으로부터 우리 몸을 보호한다(Kim et al., 1998; Elewaut et al., 1999; O’Neill et al., 2013; Yusa et al., 2017). 병원성균 침입시 NF-κB에 의해 발현이 조절되는 유전자 중 대표적인 사이토카인은 IL-8이다(Kim et al., 1998; Elewaut et al., 1999; O’Neill et al., 2013; Yusa et al., 2017). 이를 바탕으로 Ag3PO4가 우리 몸의 면역체계를 유도하는지 알아보기 위해 Staphylococcus aureus를 1시간 선처리 후 50 μg/mL의 Ag3PO4를 처리한 세포에서 병원성균 침입시 활성화 되는 면역반응 물질인 IL-8 전사가 Ag3PO4에 의해 영향을 받는지 조사하였다. IL-8 특이 primers를 이용하여 RT-PCR을 수행하였다. 발현된 IL-8의 전사량을 β-actin 유전자의 mRNA량과 상대적 비교를 통해 표준화하여 정량한 결과 Ag3PO4를 처리한 결과 IL-8의 mRNA 발현이 증가되는 것을 확인하였다(Fig. 2). IL-8의 mRNA 발현은 Ag3PO4를 처리한 시간이 늘어날수록 증가하였다. 한편, Ag3PO4를 처리하지 않은 대조군은 IL-8의 mRNA 발현이 증가하지 않았다. 이러한 결과는 Ag3PO4가 Staphylococcus aureus에 반응하여 면역반응을 유도한다는 것을 입증해 주는 것이고, 우리 몸에서 은(Ag)의 항균작용 기작이 면역반응 활성화와 관련이 있음을 시사해 준다. 또한 Staphylococcus aureus 외 다른 박테리아의 경우에도 이러한 항균작용이 해당될 가능성이 크며 이를 입증하기 위해서는 추가적인 연구가 필요할 것으로 보인다. 이와 같은 결과를 통해 Ag3PO4가 Staphylococcus aureus에 대한 항균작용과 우리 몸에서의 면역작용 활성화를 유도하는 즉, 항균작용과 면역작용 활성화 2가지 효과가 있음을 확인하였다. 이러한 결과는 앞으로 은(Ag)의 항균작용과 작용기작에 대한 연구에 많은 도움을 줄 것으로 여겨진다. Chen M, Yang Z, Wu H, Pan X, Xie X, and Wu C. Antimicrobial activity and the mechanism of silver nanoparticle thermosensitive gel. Int J Nanomedicine 2011;6:2873-2877. Eckmann L, Kagnoff MF, and Fierer J. Epithelial cells secrete the chemokine interleukin-8 in response to bacterial entry. Infect Immun 1993;61:4569-4574. Elewaut D, DiDonato JA, Kim JM, Truong F, Eckmann L, and Kagnoff MF. NF-κB is a central regulator of the intestinal epithelial cell innate immune response induced by infection with enteroinvasive bacteria. J Immunol 1999;163:1457-1466. Gurusamy KS, Rahul K, Toon CD, Wilson P, and Davidson BR. Antibiotic therapy for the treatment of methicillin-resistant Staphylococcus aureus (MRSA) infections in surgical wounds. The Cochrane Database of Systematic Reviews 2013;8:CD009726. Kim JM, Eckmann L, Savidge TC, Lowe DC, Witthöft T, and Kagnoff MF. Apoptosis of human intestinal epithelial cells after bacterial invasion. J Clin Invest 1998;102:1815-1823. Kim MK, Yeo B-E, Park H, Huh Y-D, Kwon C, and Yun HS. Dual Effect of the cubic Ag3PO4 crystal on Pseudomonas syringae growth and plant immunity. Plant Pathol J 2016;32:168-170. Klaine SJ, Alvarez PJ, Batley GE, Fernandes TF, Handy RD, Lyon DY, Mahendra S, McLaughlin MJ, and Lead JR. Nanomaterials in the environment: Behavior, fate, bioavailability, and effects. Environ Toxicol Chem 2008;27:1825-1851. Li W-R, Xie X-B, Shi Q-S, Zeng H-Y, Ou-Yang Y-S, and Chen Y-B. Antibacterial activity and mechanism of silver nanoparticles on Escherichia coli. Appl Microbiol Biotechnol 2010;85:1115-1122. Masalha M, Borovok I, Schreiber R, Aharonowitz Y, and Cohen G. Analysis of transcription of the aerobic classIb and anaerobic classIII ribonucleotide reductase genes in response to oxygen. J Bacteriol 2001;183:7260-7272. Morones-Ramirez JR, Winkler JA, Spina CS, and Collins JJ. Silver enhances antibiotic activity against gramnegative bacteria. Sci Transl Med 2013;5:190ra81. O'Neill LA, Golenbock D, and Bowie AG. The history of toll-like receptors - redefining innate immunity. Nat Rev Immunol 2013;13:453-460. Yusa T, Tateda K, Ohara A, and Miyazak S. New possible biomarkers for diagnosis of infections and diagnostic distinction between bacterial and viral infections in children. J Infect Chemother 2017;23:96-100.